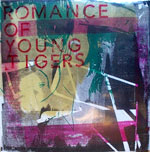 ROMANCE OF YOUNG TIGERS is a band from Dayton, OH that embodies every reason Magic Bullet Records exists in the first place. In short, the music is unapologetically revolutionary and the packaging is obsessively arduous in its creation. Whereas 99.9% of bands looking to connect with a label think that a list of "bands we shared the stage with" and a Staples-brand CD-R of "unmixed stuff we need to finish" will do the trick, ROMANCE OF YOUNG TIGERS initially dropped a visual and aural treasure chest upon our doorstep, making perhaps the greatest first impression we've ever had from a band. Masterfully-crafted songs (that truthfully can't be likened accurately to anything else out there) were housed in painstakingly hand-screened, hand-made packaging (wooden boxes, maps, the works). Not even a mention of "shopping" for a label. In short, they made fans of us instantly. I Have Supped Full Of Horrors is the formal launching of their previously self-released (and inaugural) triumphant bludgeoning of all things mediocre. 4 tracks, 35 minutes of sheer brilliance. A lot of bands can shove a wall of sound in your face. Plenty of bands have a guy or two who is technically "amazing." Very few bands can unite both into an engrossing, captivating listen... and even fewer can do so WITHOUT PERCUSSION. It is in this rare air that ROMANCE OF YOUNG TIGERS hovers high above the glut of instrumental rock to inundate listeners in recent times. For a band to come right out of the chute with such a dynamic and captivating sense of taste versus composition is truly a treat to behold and indicative of a revolutionary trajectory in years to come. They know when to come in, they know how to hook you, they know when to leave you wanting more. W/ Triangle (collaboration set) at 4pm. Beautiful building, should be a very fun show. 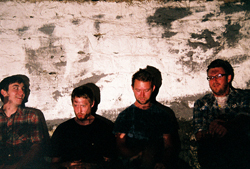 • Angry Ape: "Romance of Young Tigers Ink Deal With Magic Bullet Records"